Following the success of their incredible Millennium Falcon, Han Solo, Luke Skywalker, Kylo Ren, R2-D2, Rebellion and Resistance sneakers, the incredible team at Po-Zu have set their sights on ace pilot Poe Dameron. Their amazing ethical range of vegan-friendly boots and sneakers have taken the world by storm in recent years and are flying across the world to take pride of place in Star Wars fans’ collections everywhere. The greatest characters of the saga have been well represented amongst their exceptional range but now, CEO Sven Seagal and his devoted team are about to choose a side in the struggle against the First Order. Ahead of this year’s highly-anticipated finale of the Star Wars sequel trilogy, Po-Zu, the brand behind Rey’s actual boots from the films have released their latest stellar design. There is nothing more central to the Star Wars story than the brash and brazen X-wing pilots, whose skills and one-in-a-million shots make up the very essence of everything Star Wars. Now Star Wars fans have the chance to RESIST and stride out in style. The latest shoe to be released by ethical shoe brand Po-Zu shows vivid schematic detail of X-wing fighters in action surrounding a striking helmet design. Screen-printed onto organic cotton canvas with a red embroidered label and foxing detail, the newest Star Wars inspired vegan unisex sneakers feature fair trade rubber soles that are stitched to the shoe to provide durability. Sven and the great team at Po-Zu have excelled with their incredible Star Wars range and have consistently defied our expectations to produce some of the finest footwear in fandom, and the super-cool X-Wing Sneakers are no exception. So, whether you’re skimming across the waters of Takodana, flying into battle above D’Qar or just taking a pleasure cruise around Hoth, the all-new Star Wars X-Wing sneakers are the perfect choice to accentuate your wardrobe. Feel the force on your feet and pre-order yours here for immediate delivery. 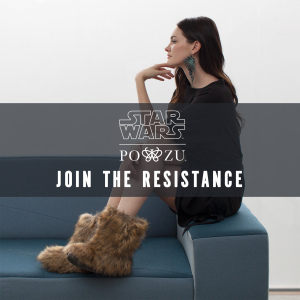 Check out the full Po-Zu/StarWars range.